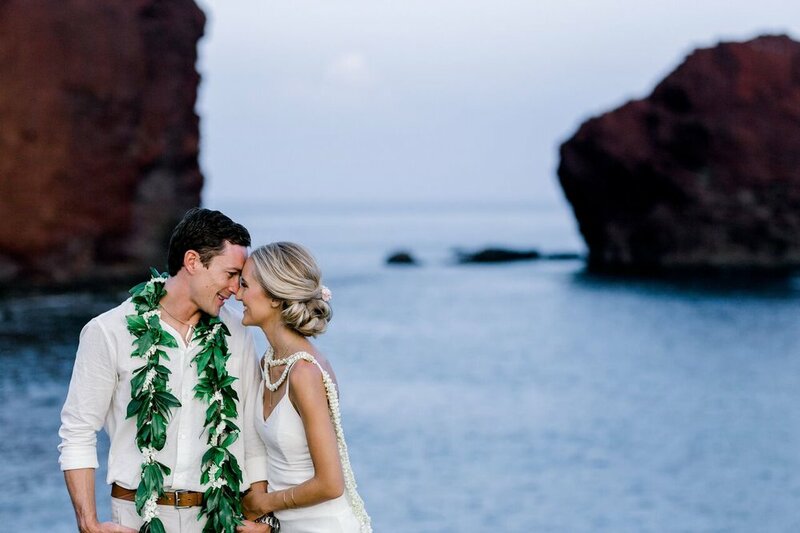 The bride & groom of this picture-perfect wedding, Alex & Denver, were both original residents of Hawaii Nei, where they grew up, and still reside here on island (though they can often be found at their second favorite place in the world - Tahiti)! 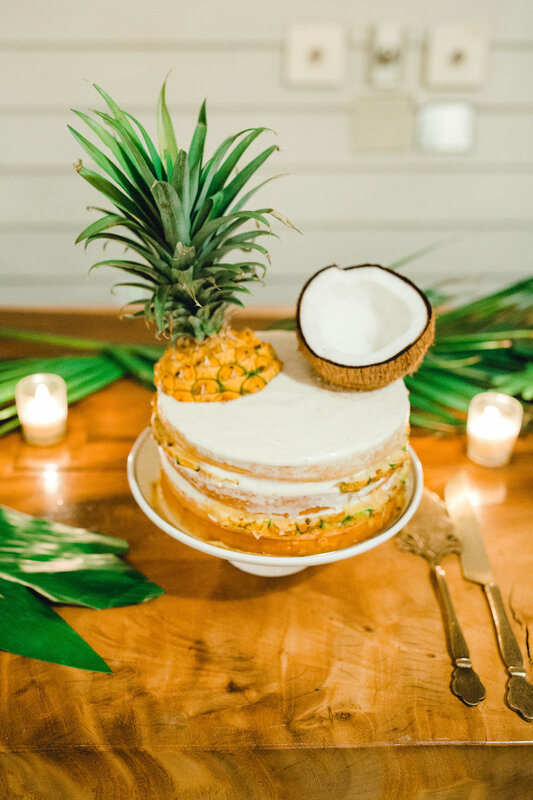 Growing up Hawaii, the island life naturally shaped the vision for their wedding day, and after their engagement, they already had a style in mind - a Modern Tropical celebration, accented with a Taste of Home. The couple not only knew they wanted an outdoor wedding from the start, but also knew that a more unique and intimate setting would allow their big day to truly reflect their own personalities. 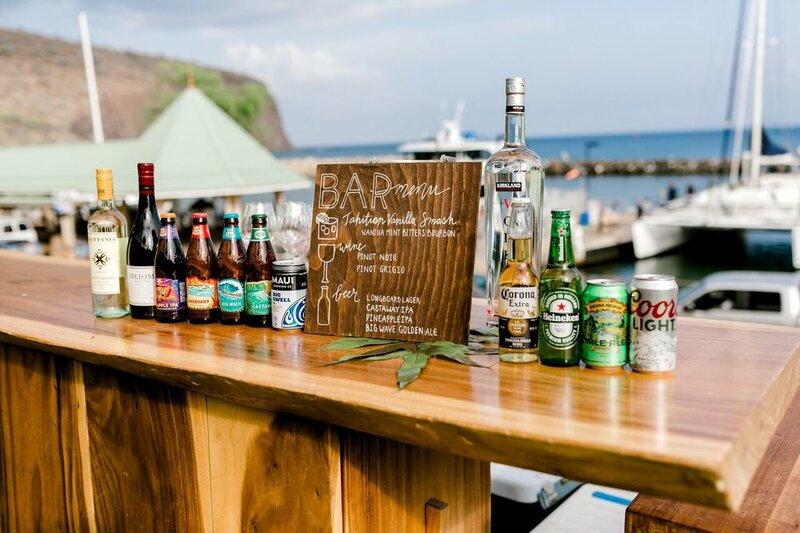 After some initial planning, Jenny knew that the classy yet homestyle vibe of Trilogy’s Hale o Manele met both of these requests and would create the modern destination wedding feel that the couple hoped to share with their Maui & Oahu guests. The natural wood elements and tropical vegetation of the Hale complemented their vision of modern rustic, and made the remaining décor needs simple and FUN. And one secret weapon the Trilogy team soon discovered - Alex’s love for artistic creation, and in particular, all things floral! With her unique creative abilities, Alex actually sketched out just how she wanted her bridal bouquet and table arrangements to look, giving our team a seamless transition to bring these visions to life. The piece de resistance: a 10 ft. tall live greenery wall as the ceremony backdrop, also sketched by Alex, and commissioned by local Maui florist, Petals Maui. 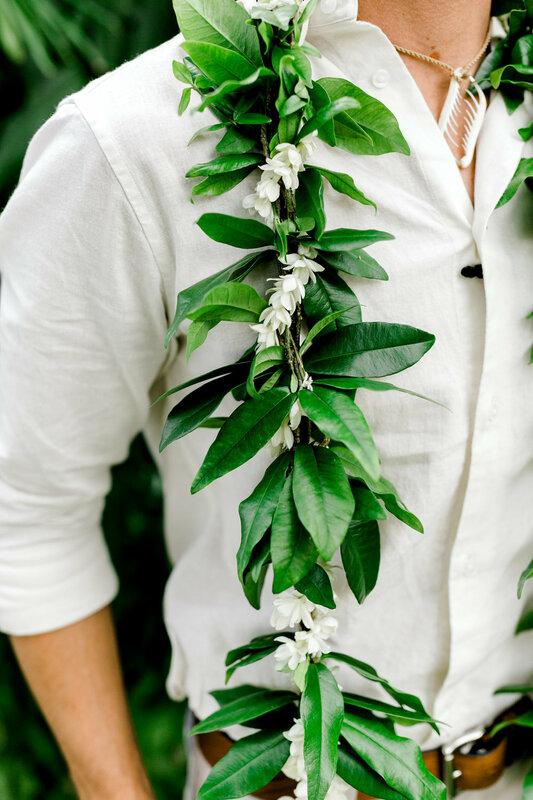 The day before the BIG day, Trilogy coordinated with the vendors, along with Alex and her wedding entourage, to head across the ‘Au ‘Au channel to the quaint little pineapple island of Lana’i, where they artfully hand-crafted each floral arrangement from Alex’s sketches. Bouquets & centerpieces of torched ginger, anthuriums, beehive ginger, ti leaves, monstera leaves, and giant palm fronds popped vibrantly against the seaside venue, resulting in an overjoyed bride & groom, and a very contented wedding planner! For the weekend celebration, the couple had reserved a room at the Four Seasons Resort Lanai, which ended up working dual-duty as the perfect bridal suite for Alex and her bridesmaids to get dolled up by the supremely talented makeup & hair artists of MeiLi Autumn Beauty. Just a 4-minute drive to Trilogy’s Hale, this convenient spot allowed Alex ample time to prepare for her big walk down the natural grass aisle. Working with Jenny on a carefully constructed 6-hour timeline of events for the day, the couple talked through some options and decided to even add an additional 2 hours to their timeline, assuring a relaxed pace for the ceremony and post-nuptial celebration. The couple went to bed and rose the next day to a beautiful Hawaiian day - sun shining, ocean waves lapping over the warm sands of the beach… and a truly special day ahead of them! 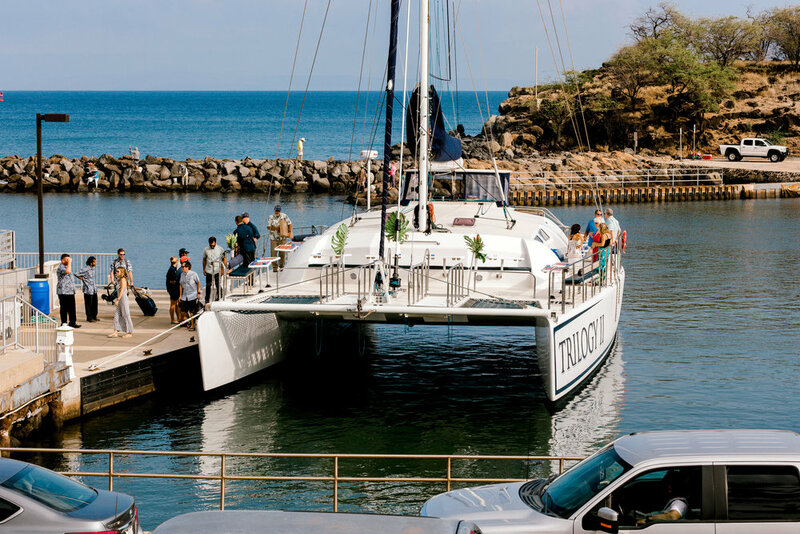 As guests arrived to the island on the elegant 64-foot Trilogy II sailing catamaran, they made the short walk up to the Hale lawn, where custom Monkeypod wood benches had been set up on the Hale’s spacious lawn for the I Do’s. Jenny had coordinated with Mike Lopez, a respected and well-known elder born on Lana’i, to serve as the couple’s very special and undeniably Hawaiian officiant, lending an extra unique touch to the couple’s vow exchange. After the ceremony and family photos, the couple snuck away with SB Photography for a little something special - the timeline extension had actually allowed for an added picturesque walk along Lana’i’s breathtaking rocky coastline to capture some truly once-in-a-lifetime shots; a magical, quiet moment during the day’s festivities that the bride & groom could recall fondly for years to come. While the couple enjoyed their romantic photo shoot, guests were delighted by the tunes of live music from Marc Sings Maui, playing Bocce and other lawn games, as they snacked on light appetizers (ahi poke cucumber cups & cilantro shrimp skewers?! yes, please!) and enjoyed the custom-created cocktails (like the Tahitian Vanilla Smash) at the Hale’s open bar. After the photo shoot, the bride & groom were escorted back to the Hale for their first dance on the lava stone tiled dance floor. In keeping with the theme, a genuine “Taste of Home” buffet dinner was next served by Maui Flavors Catering, piping hot and absolutely delicious (see below for full menu). A Kula mixed green salad with shaved Maui onions served as the perfect light start for a dinner that had all the true makings of a Hawaiian feast - wok-fried vegetarian chow fun noodles, steamed white rice, and Kalua-style pork & cabbage, to name a few! 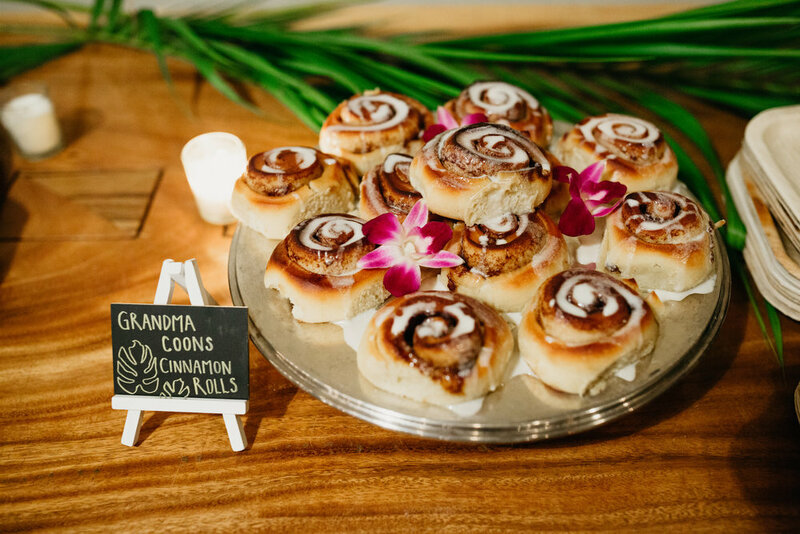 For dessert, Alex & Denver chose a spread that would continue to showcase their island upbringing, with mini Haupia Moloka’i sweet potato pies, upside-down pineapple cake, and Trilogy’s famous cinnamon rolls - a treat that the groom had grown up with since childhood. 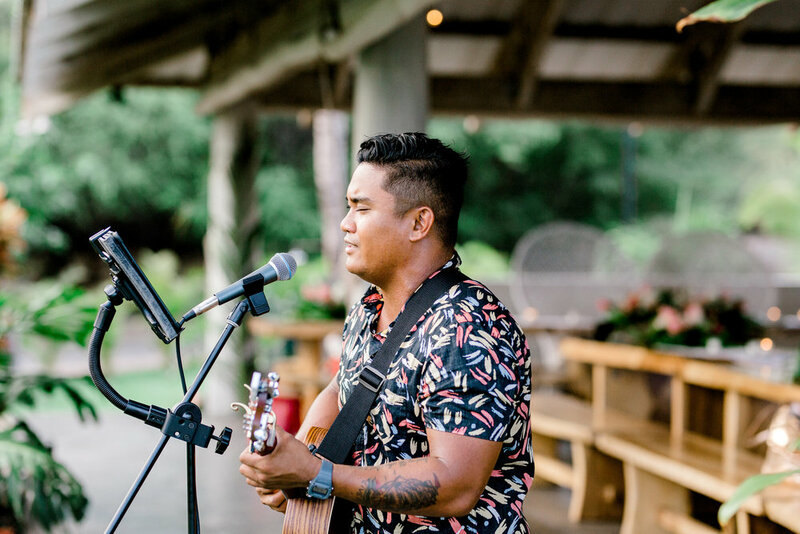 The last hours of the wedding celebration brought with it all the things a bride & groom could hope for: champagne toasts, a packed dance floor full of happy, joyful guests, and expert DJ entertainment from Marc Sings Maui! And with a room reservation so close to the venue, Jenny was able to coordinate a perfect way to end the evening for the new Mr. and Mrs. - a sparkler-filled archway of guests lining the Hale lawn, creating a magical sendoff.